A student project becomes an actual product for sale. Bonus: Gizmodo’s coverage of it, with the usual smug, dismissive comments following. 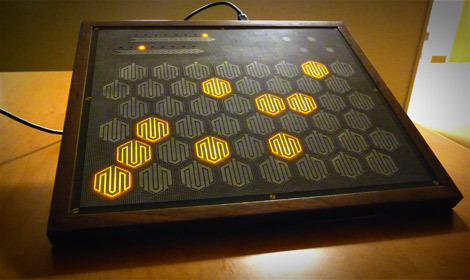 You won’t find more simpler obscure gadgets than the ones sold by Sonodrome. They even have PC software to go with their little bits of hardware. PC boards come in four colors. (And MAKE magazine’s market is selling the amplifier kit, along with the Atari Punk Console.) Enclosures are up to the builder. YouTube videos here. 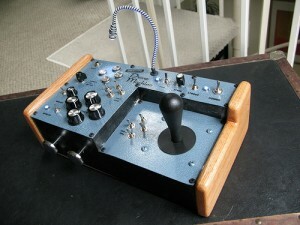 Great idea, and the controller is based on Linux, allowing you to mess with its operation. Mentioned on Slashdot. Is it still being made? I can’t tell, the order form was on an AOL homepage, which has since been pulled down. 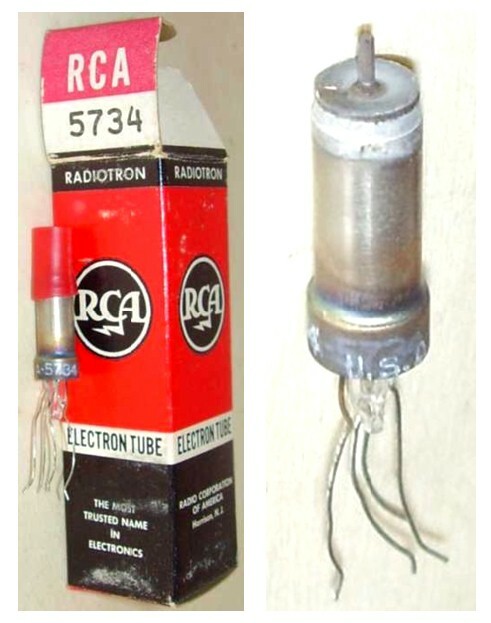 First, did you know that RCA made a vacuum tube that was usable as a phonograph pickup? Second, Feena Electronics. 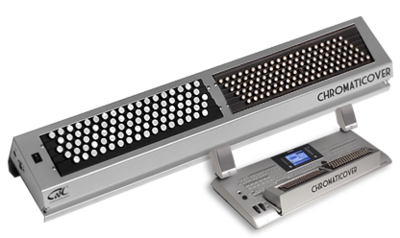 They introduced an interesting DJ MIDI controller in 2006. Since then, nothing. The last post to their forum was September 21. Finally, this guy is building a duplicate of the old Metasonix Hellfire Modulator. He’s making a chassis for it out of plain sheet metal, and he apparently mated two toaster ovens together in order to bake powder-coating onto it. DIY FTW!!! It’s an analogue drone-box with a much vaster range of sound effects than single-box devices can usually do. Simple yet complex. How to play stuff found in thrift shops. 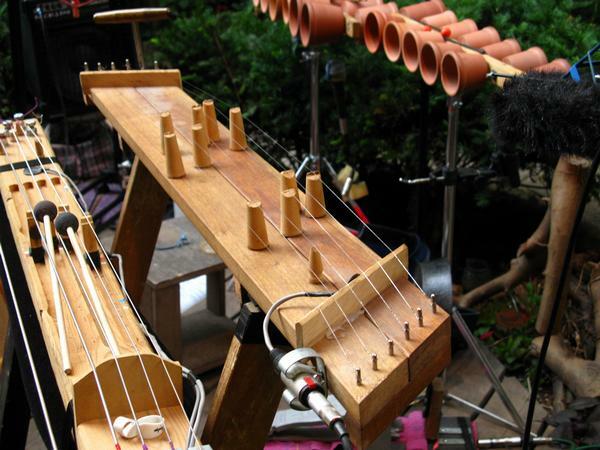 NYC artist Terry Dame and her “Electric Junkyard Gamelan”. Except for the contact mics, I don’t see anything electric in her shows, but this is a good example of what anyone can do with the most basic (cheap) tools. 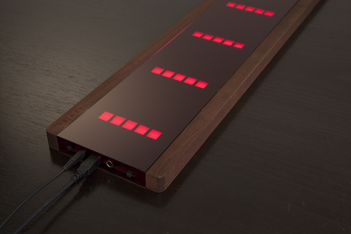 There’s been a big stink about the British-made Eigenharp controller, with mention from Engadget, Synthtopia, the BBC, and bloggers like CDM and Matrix. It requires a Mac, however. Hope they sell some and are encouraged to port the software to Windows. Given its complexity, ~$7000 isn’t a terribly high price. Almost forgotten in all this hype was a different controller, the Madrona Soundplane. Looks as though it’s not finished yet. The Cool Chromaticover. You can’t really tell from these terrible product pages, but this is a standalone MIDI controller with velocity and several slightly different key arrangements available, that just happens to be made to fit over the keyboard on a Yamaha combo instrument. 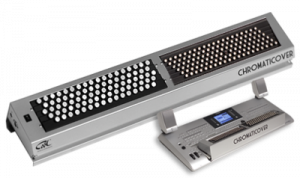 Unlike the Yamaha (or most other MIDI controllers) the Chromaticover appears to be really well-made, mostly metal with metal buttons. The only dealer selling it (piens.be) is also the owner of the company making it (cool.be). Also strange is that very few people in the accordion world, or elsewhere, even know this product exists. I’ve found very few Google mentions of it. A gourd. With a synth. My favorite part: look at the “Related Videos’ section. It includes a mishmash of weirdness, including a promo video for “Kokopelli Rising” by “Bing Futch”, a bland New Age album. The exact opposite of what Dave Wright does with his gourd. And now, he’s put it on eBay for sale…….. The work of mad Swedish artists Erik Nilsson and Peter Kädergård. Video here. What would you do with a player piano with MIDI input? More about his project here. 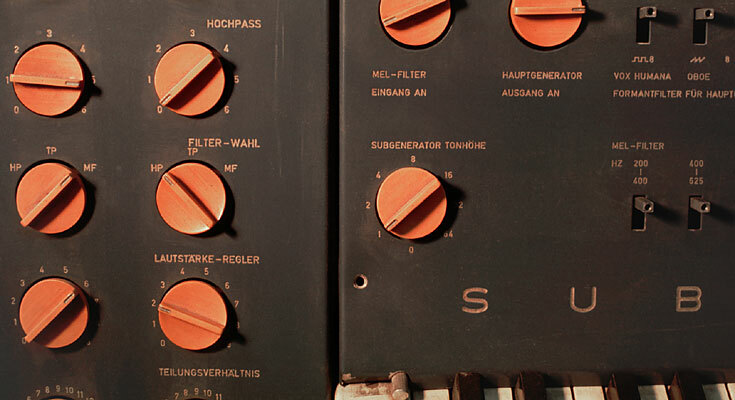 It was built in an East German acoustics lab, and used in soundtracks for East German movies. It predates any Moog or Buchla synth. You won’t find it mentioned in any textbooks, nor is it listed in the famous 120 Years of Electronic Music website. Luckily Germans have preserved and restored it. The main website is here. 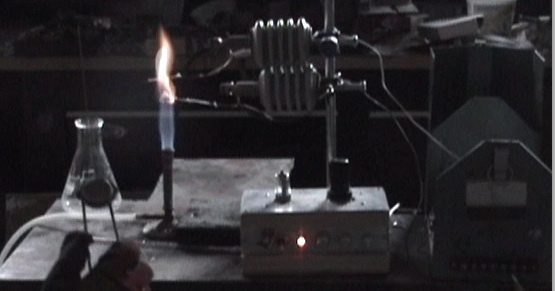 Ionized gas, chemicals, heat and applied high voltage conduct through a flame, modulating the impedance across the grid and or plate of vacuum tubes. This applies a control voltage to a Phantastron synthesizer. by Not Breathing……ugliest old radio I ever saw. Video here, synched with an Akai MPC. Also of some note: the work by Snyderphonics. Their Manta USB controller looks like a winner. So buy one. They build some damn impressive gadgets…..that do something. And how often do you get to read about Paul Ketoff and his notorious Syn-Ket? Not to mention its predecessor, the Fonosynth. Yet another great unsung pioneer of music synthesis. but he did build a complex noise box, and he circuit-bent a TV set. Then we have this thing, made of an old SN76477 noisemaker chip. Dekatrons are erratic and unreliable. Same guy who previously built a modular synth out of tubes. 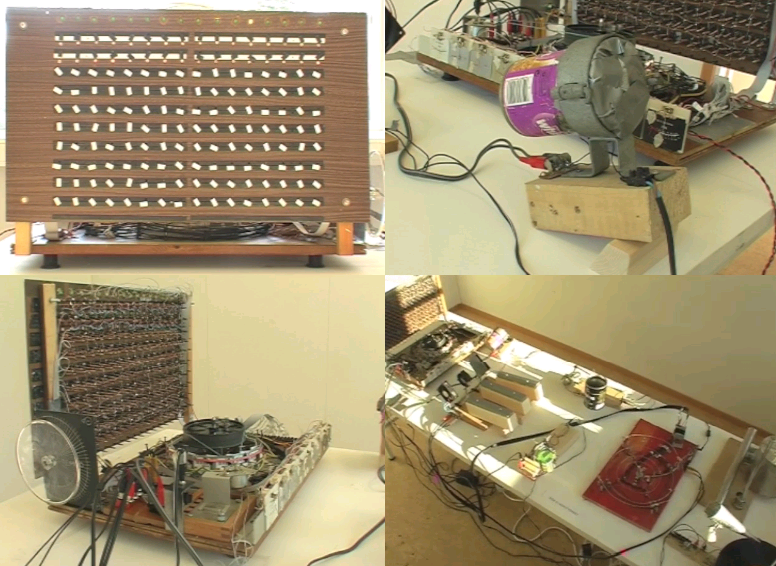 An experimental analog video synth–very rare to see anyone doing this today. 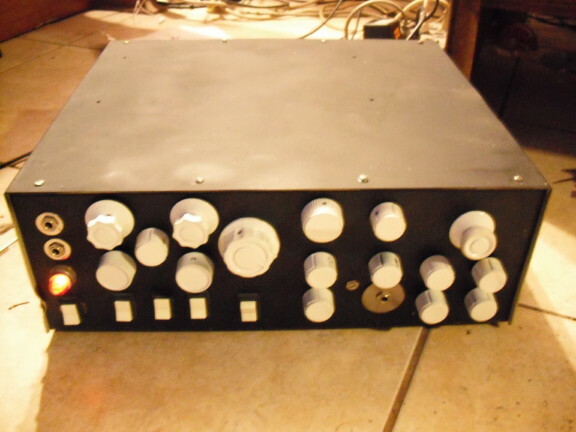 It’s got tubes, it’s got transistors, it’s got a CD on a variable speed motor with the coating scratched off and a photo pickup underneath……it’s not on his website. Why does he do things like this? Want to explore alternate tunings? Now it’s easy. 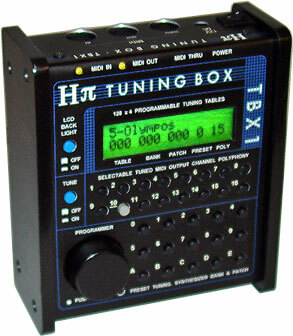 H-Pi has released a new, updated version of their Tuning Box. It does any arbitrary tuning setup, from Archytas Septimal to Just to Harry Partch’s 43-Tone Chromelodeon Scale to Johnston Enharmonic. 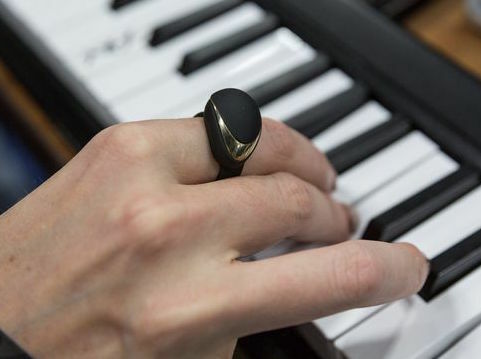 You name it, if your MIDI synthesizer accepts pitch bend, this device ($299 is an amazing price) will generate the correct MIDI messages to make any alternate tuning or key reassignment desired. I’ve already ordered one for my own experimentation. H-Pi also had something on its website that amused me. The New York Times ran a strangely familiar article four months later…..